In the United States, teen birth rates have been steadily declining since 1991. [i]For childbearing teenagers between 15 and 19, the birth rate has declined 61 percent since 1991. Yet, teen birth rates remained at 250,000 births in 2014. [ii]Even with the decline in the teen birth rate, the United States has a higher teen birth rate than many developed countries, including Canada and the United Kingdom. [iii] In order to address rates of teen pregnancy in the United States, teen pregnancy prevention programs have been implemented nationwide. For Missouri, the state is currently ranked 30th in the nation for teen birth rates at a rate of 25 per 1,000 girls in 2015. [iv] The state’s teen pregnancy prevention programming is implemented through the Missouri Department of Health and Senior Services (DHSS). Funding was awarded to DHSS to implement evidence based teen pregnancy prevention programming focusing on sexually transmitted infection (STI) and HIV prevention programs. Since 2011, DHSS has contracted with the Institute of Public Policy (IPP) to serve as external evaluators for prevention programming. Each year, the Institute conducts a four-part evaluation of teen pregnancy prevention grant recipients. This includes a process evaluation, a fidelity evaluation, an outcome evaluation, and a community capacity evaluation. The evaluation of MOTPP Year Six was completed September 30, 2017. DHSS uses the annual evaluation report to monitor program success, and to help make program improvements where needed. MOTPP is currently in its seventh program year, which began August 1, 2017 and will end July 31, 2018. In 2017, the evaluators conducted an additional analysis through longitudinal data collected for the Missouri Personal Responsibility Education Program (PREP). The analysis serves as an overview of PREP from the 2011 implementation to the most recent program year ending in 2017. Data collected from the six program years identified longitudinal results that determine the performance of the program. The Evaluation Team reviewed overall program implementation and criteria such as: stakeholder relationships, outcomes, community and location, sustainability, and lessons learned. The results of the report show that from 2011-2017, 2,574 youth completed the program and 3,956 youth participated in the PREP program.Programming actively targets youth in Missouri counties at the highest risk for teen pregnancy. The analysis identified that 72 percent of PREP counties rank at the highest risk for teen pregnancy with potential to reach the remaining high risk counties. Age is a significant factor in knowledge gained during PREP. African American youth and younger youth are more likely to state that they are respectful toward others and that they will get more education after high school. African American youth are more likely to feel that they care about doing well in school and that they can resist or say no to peer pressure. Female youth are more likely to state that they can share ideas that matter with a parent or guardian. Male youth are more likely to say that they know how to manage stress. In conclusion, the longitudinal analysis provides a comprehensive review of the six years of the Personal Responsibility Education Programming. PREP has shown continuous quality improvement in an attempt to improve teen pregnancy prevention outcomes in Missouri. 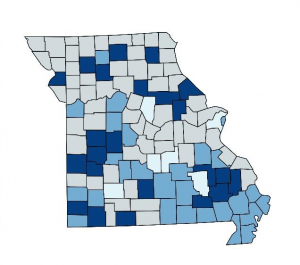 Teen pregnancy prevention is a complex topic with the capacity to provide crucial education to Missouri youth who are at a higher risk of becoming pregnant than their peers. The analysis identifies the need to increase community involvement and improve participant feedback to ensure quality pregnancy prevention education for the target population. The findings of this analysis suggest that PREP has a critical impact on the youth participating in the program and a potential for a sustainable impact in Missouri. A two-page fact sheet on the analysis can be found here.